LOS ANGELES, April 7, (RTRS): John Krasinki doesn’t normally watch horror movies. 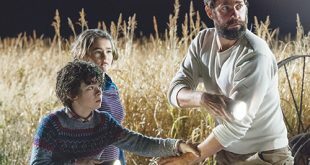 So when the time came to direct “A Quiet Place,” a monster thriller set in a world where nobody is allowed to make any noise, he had to cram. RTRS: Is it true that you don’t like scary movies? Krasinki: I don’t think you look at my name and you say that guy is going to do a horror movie. I certainly wouldn’t feel that way. The truth is, I never saw it as a horror movie. When I got the script, it was scary. The thing I bonded to most in the original draft was this idea of family. We had just had our second daughter three weeks before I read the script. I was an open nerve. So when I did my rewrite, I thought I could really make this a metaphor for parenthood — the idea of protecting your kids. And how far would you go to protect them. After that, all the scary stuff came because you care so much about this family. RTRS: How did you make this movie so inexpensively [with a reported budget of $17 million]? Krasinki: Honestly, that was mostly due to the insane amount of talent we had on our crew. We had an A-level group from top to bottom. And probably, most importantly, ILM [Industrial Light & Magic], which designed the creature with me. They’ve said this is one of their favorite movies that they’ve done. I think it’s because when we started, we brought them in. We created something so special that I think they went a little bit above and beyond their budget and timing to deliver. RTRS: Did you know Emily was going to be in it from the start? Krasinki: I was worried she was going to say no. She was really busy. Also, she’s very specific about her choices. And I admire that so much. She’s so incredibly talented, but she has such incredible taste. I didn’t want her to do it for me; I was worried that would be the answer. I wanted her to do it for herself. It couldn’t have been more organic how it came about. She actually recommended some other actresses for the part that she thought would be great. And then, all of a sudden, she read the script and came to the end of it and she said, “You have to let me do this role.” I know it sounds corny, but it was the best compliment of my career. Knowing what it takes for her to say yes to a project, the fact that she loved the script enough to do it was just awesome. RTRS: Were you nervous about working with your wife? Krasinki: I was nervous to direct her or work with her before we started shooting. We both talked about it a lot. Luckily, we were both nervous. It’s because we both have our own individual process. It was more about, “What if he gives me an idea that’s terrible. Or, what if she gives a performance that isn’t how I saw it?” And so what we did, we spent all the weeks leading up to it going over the script. I walked her through the entire movie of what I was going to shoot before we shot it. All the ideas that she had were really smart. She was so confident, so caring, so supportive that by the time we got to the shoot, there was nobody better to have on set than her. She stood next to me and watched me direct the scenes she was in or the scenes she wasn’t in. It’s the best collaboration I’ll ever have. LOS ANGELES: Los Angeles Family Housing presented Dwayne Johnson with its highest honor: the Inspiration Award. The actor accepted the trophy last Thursday night during an emotional ceremony where victims of homelessness, including Johnson himself, shared their stories. Members of Hollywood and other distinguished guests gathered at The Lot in West Hollywood for the awards dinner, hosted by actor P.J. Byrne. Throughout the night, guests bid on various auction items to support the organization’s humanitarian mission, including house seats at a U2 concert that went for $15,000 and an eight day European cruise that went for a total of $16,000. “He always talks about his journey and overcoming odds to become who he is today, so I can’t really think of anybody who stands for this issue of overcoming adversity and how poverty doesn’t have to be the limitation or definition of who you are more than Dwayne Johnson,” Rich said. After a high school girl and family helped by LAFH spoke about their struggles with low income and limited access to basic health and living needs, Johnson recounted his past experience with homelessness during his acceptance speech. Johnson had to pause at moments to keep his composure during his speech, in which he also detailed his grandmother’s battle with homelessness and his separation from his family. He also recalled coming home to eviction notices and having to steal food from grocery stores to bring back to motels as he bounced from city to city across the country. “Why this award is really special to me is that I know what it’s like not to have the security of a home,” Johnson said. The “Rampage” star also reminded other Hollywood attendees in the room of of their elevated positions and thanked them for supporting a cause that could have helped him and his family when he was growing up.